Childhood food allergies are worrying things so it’s no surprise that many parents get stressed at the prospect of it happening to their kids. But with proper care and attention, food allergies can be managed, and there’s no reason your child can’t grow up healthily and happily. First of all, don’t mix a food allergy up with food intolerance. An allergy is an immune system response and symptoms can occur just a few seconds after eating the trigger food. Reactions can be mildly irritating, but they can be life threatening in some children. Common symptoms of food allergy are itchy skin, itchy tongue and lips, sneezing, stuffy or runny nose and coughing. Any food can cause an allergic reaction, but the most common culprits are citrus fruits, cows’ milk, eggs, nuts, shellfish, Soya, tomatoes and wheat. The most important step you can take is to breastfeed your baby and avoid supplementing their diet with formula milk or offering solid food until they are at least six months old. If you can’t breastfeed, talk to your health advisor about using a hypoallergenic infant formula. Don’t just switch to a Soya formula or to goat’s milk, because the same kids who are allergic to cows' milk may be allergic to those too. If allergies run in your family, and they often do, a few early precautions can reduce the risk for your child. 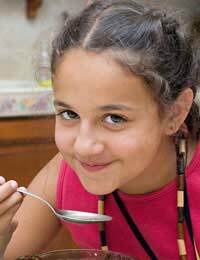 Start to offer rice and oat cereals when it’s time for solids, rather than wheat-based cereals. Once your child is used to this, start introducing vegetables, but avoiding peas and beans. Fruit is okay too, but avoid citrus fruits like oranges and tangerines. Don’t begin to give your baby meat or protein foods until they’re eight or nine months old. Don’t give your child dairy products, citrus fruits or wheat until they’re a year old. Eggs shouldn’t arrive on the menu until your child is over two and don’t bother with peanut butter or prawns until after your child has turned three. The first thing to do is to make sure it’s definitely an allergy that’s causing the problems. There are other conditions that can cause similar symptoms, so you’ll need to talk to your doctor about this. Never try to diagnose your child yourself. The main thing is to prevent you child eating their trigger food. This is still the most effective way of dealing with a food allergy. Read food labels and find out all the alternative names for the culprit food. For example, caseinate and whey are both derived from milk, so kids with a dairy allergy shouldn’t eat them. Your dietician or allergy specialist will help you with a full list of names to look out for. Don’t let your child eat anything that’s been prepared with equipment that was also used to prepare any trigger foods. Plan ahead for packed lunches, birthday parties, holidays and eating away from home. Start working out what your child can and cannot eat and letting schools, relatives and your child’s friends’ parents know. Start getting to know the alternatives that are available. Shopping for a special diet can be daunting at first, but it will soon be second nature. Many supermarkets and health food shops now carry special ranges free of many of the key trigger foods like dairy, wheat and eggs. Invest in some special diet cookbooks to help you create tasty, varied meals and snacks. There’s no reason your child should feel deprived. Remember to always replace foods you have removed from your child's diet, with foods of a comparable nutritional value. Get expert help from a dietician to avoid nutritional deficiencies. Never reintroduce trigger foods without expert medical advice. Remember, it’s estimated that up to 90% of kids will grow out of their food allergies, so you might not have to be the food police forever! If your child is diagnosed with a severe food allergy, make sure you always carry adrenaline with you. This is the key treatment in the case of an anaphylactic reaction. This is a life-threatening allergic reaction that demands emergency medical treatment. Symptoms come on extremely quickly and may include itchy skin, a rash, swelling of the lips and tongue, tightening of the throat, breathing difficulties and faintness. If immediate action isn’t taken an anaphylactic reaction can cause unconsciousness and can even be fatal. If you think a child is having an anaphylactic reaction, do not delay - phone for an ambulance immediately. The most common trigger foods for severe allergic reactions in children are eggs, milk and nuts. As frightening as it might seem at first, there’s plenty that you can do to reduce the frequency and severity of your child’s allergic reactions. There’s no doubt that it takes care, patience and organisation, but developing a passion for reading food labels, and keeping in touch with your family doctor will go a long way towards ensuring your child can grow up healthy and strong – and loving their food.